Welcome to the World’s Largest One Day Maple Syrup Festival. ​Every year since 1965 Elmira has hosted this annual event that attracts nearly 70,000 people ready to taste the local maple syrup poured onto thousands of pancakes. Please join us and taste, smell and experience the Elmira Maple Syrup Festival. The entire family will enjoy the tradition! ​​Children are welcome on this trip. If the child is using a seat on the bus, the price is the same as that for adults. Infants "in arms" are free of charge. 7:00 AM York Mills Subway Station, in front of 4025 Yonge St.
11:10 AM Kipling Subway Station, Passenger pickup area. 6:45 PM Vaughan, Weston Rd & Hwy 7. in front of Scotiabank. Seats are limited, seat reservations are required in advance. Trip goes ahead rain or shine. Children are welcome on this trip. If the child is using a seat on the bus, the price is the same as that for adults. Infants "in arms" are free of charge. 100% full refund if you cancel at least 7 days before the trip departure date. Sorry but no refunds if cancellation is received less then 7 days before trip departure date. Things to do at the festival! There is lots for you to see and do at the festival. Pick and choose whatever you'd like, almost everything is either free or available for just a few dollars. ​The best activity of all is of course to experience the "Mall" which is like no other on this special day. Craft booths, apple fritters, baked goods, toffee, maple syrup and mouth watering home-style foods await you and your appetitte along this 1 km stretch of vendors and people! Try the golden-brown pancakes and famous maple syrup. You will find them just off the Mall on Wyatt Street. Get yours before they’re gone! Browse the Mall & Excite your Tastebuds! Craft booths, apple fritters, baked goods, maple syrup and much more await you and your appetite along the half-mile-long outdoor Mall. Plus, mouth-watering, home-style meals are featured at the local churches. Savour Old-Fashioned Toffee. See the old-fashioned way of boiling down the sap and sample unforgettable maple syrup toffee. $1 per sample. Listen to Live Local Bands in the Gazebo. Visit Old MacDonald’s Farm. 8 a.m. – 4 p.m. $0.50 adult/child. See the animals, find your way through the straw maze and climb on the tractor in the buggy shed by the pancake tent. Go for a Pony Ride. $5. Your little tots can take a ride around the ring on ponies that are just their size! Catch a Movie on Mennonites. 11 a.m. & 12, 1, 2 & 3 p.m. The Mennonite Story and Farmers Plus present special screenings of two short films in the Farmers Plus boardroom across from Home Hardware. Toy Show & Sale. 8:30 a.m. – 4 p.m. $2 adult. 12 & under free. Explore the Sugar Bush. 9 a.m. – 3 p.m. $5.50 adult, $3.50 child 3-12, 2 & under free. 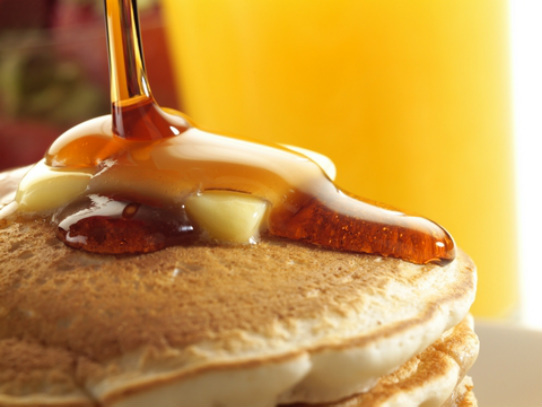 Venture out to a local sugar bush by bus to experience all of the maple syrup preparations. For more information, please visit the Elmira Maple Syrup Festival website. Click here.